After the movie last night, we were relaxing and eating and talking at the Hong Kong restaurant and the suggestion came up that I start making weekly updates to this blog about that week's film. It's a great idea and I can't believe I wasn't already doing so. 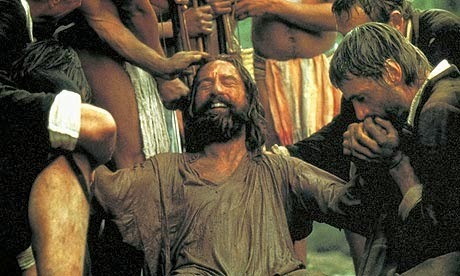 The Mission is a 1986 British drama about the experiences of a Jesuit missionary in 18th century South America. The film was written by Robert Bolt and directed by Roland Joffé. The movie stars Robert De Niro, Jeremy Irons, Ray McAnally, Aidan Quinn, Cherie Lunghi and Liam Neeson. It won the Palme d'Or at the Cannes Film Festival and the Academy Award for Best Cinematography. In April 2007, it was elected number one on the Church Times's Top 50 Religious Films list. The music, scored by Italian composer Ennio Morricone, was listed at number 23 on the AFI's 100 Years of Film Scores and ranked 1st on the Australian Broadcasting Corporation's (ABC) Classic 100 Music in the Movies. Here is an interesting review. I saw this film in theatres when I was at the University of Mary. I can't wait to see it again!